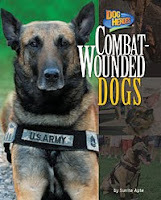 Combat-Wounded Dogs by Sunita Apte is about dogs who have served in the US military. The US military officially began using dogs in combat during World War II. Dogs may have saved as many as 10,000 soldiers during the Vietnam War by detecting explosives and weapons in the jungles of Vietnam. Military dogs perform many different jobs overseas. They might guard military bases, search buildings, or detect explosives. Today military dogs are considered 4-legged soldiers and usually have a higher rank than their handlers! At my library we have a noticeable population of grade-school boys who are interested in all things military. This will be right up their alley. You might even pair this title with Letters from Wolfie, a novel about a boy who offers up his dog for military service during the Vietnam War. 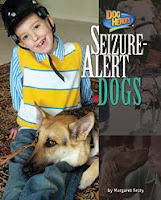 Seizure-Alert Dogs by Margaret Fetty is about service dogs that detect seizures for their owners. These dogs can sense tiny changes in their owner that alert them that a seizure is coming. Some dogs can detect seizures up to 12 hours before they occur and they are trained to let their owner know by barking or pawing at them. When their owner has a seizure, dogs protect them. Some even call for help using special buttons, switches, or even the telephone. These are truly amazing stories of dogs that have saved the life of their owners. Both titles are very well laid out with lots of full-color photographs and simple text that will attract reluctant readers. Even voracious readers will love learning about these talented dogs. Each book includes a glossary, bibliography, and list of books and websites for further reading. If you're in a public library, make sure you have these books on the shelves. I guarantee they won't stay on the shelves for long. Happy Nonfiction Monday! Anastasia's got the roundup over at Picture Book of the Day. These look like wonderful books! I think my son and I would love them. Thank you. These seem like very good and educational books. I've just discovered your blog and will be back!